Why have an eye lift or brow lift at Therapy House? A bit like a balloon losing air, the skin around your eyes and brow can begin to loosen and sag over time, which can make your eye area look shadowed and heavy, or give you a drooping, asymmetrical brow. There are ways to lift the skin around your eyes using dermal fillers and wrinkle reducing injections, instead of having to consider cosmetic surgery. When you come to our clinic, our aim is to make sure that you are in safe, experienced hands as your eye area is delicate and needs a careful approach. The eye area is one of the first parts of the human face to show the signs of ageing, thanks to a loss of volume and the wrinkles caused by expressive movements. This can make you look tired and create hollows and shadows. With a surgical eye lift, loose skin is cut away, which can permanently change the entire eye shape. With a non-surgical eyelift, on the other hand, we can replace the lost volume and subtly lift your eyebrows to make you look younger and refreshed without fundamentally changing the shape of your features. Another benefit of a non-surgical eyelift that incorporates dermal fillers is that you will see the results within a matter of minutes, and the treatment is only associated with minimal downtime. How do wrinkle reducing injections work in an eye lift or brow lift? When wrinkle reducing injections are injected into small facial muscles, they temporarily stop them from contracting, which helps to minimise the appearance of expressive fine lines and wrinkles. To help achieve an eyelift, we can use these injections to smooth away horizontal frown lines, vertical brow lines, crows’ feet, and to stop your muscles from pulling your eyebrows down. This will help to give your eye area a lovely youthful openness. We can also use wrinkle reducing injections to address areas of asymmetry (brow ptosis) and help both sides of your face look more balanced. How do dermal fillers work when used for a non-surgical eyelift? We use dermal fillers to replace lost volume and hydrate the areas around your eyes that may currently look tired and hollow. We can inject small quantities of dermal fillers to minimise the dark shadows under your eyes, or smooth out the sagging skin of your eyelids by adding volume around your eyebrows and temples. This should also give your eye area a more open and youthful appearance. We have adopted the use of MD CodesTM, which are a series of formulated injection points for dermal fillers proven to elevate, rejuvenate and enhance, as well as delivering natural results. Read more about MD CodesTM. We will spend some time talking to you, analysing your skin, and pinpointing which products we need to use to create a natural-looking and effective eye lift. We may ask you to pull some facial expressions so that we can understand how specific facial muscles move. Once we have the full picture, we will inject dermal fillers and/or wrinkle reducing injections into targeted points around the eye area. The needles we use are very fine, which is important to give you a comfortable experience. Most people describe the injections as feeling like a tiny pin prick. With dermal fillers, you should be able to see the results of your treatment immediately. If you also have wrinkle reducing injections, you should continue to see improvements over the five to ten days after your treatment. We will give you an appointment for two weeks after your treatment so that we can check that you are happy with the results. A free top-up treatment will be administered, if required. How long should the results last? Most people find the effects of wrinkle reducing injections last for up to four months, whereas dermal filler treatments can last for up to a year – some people even enjoy the results of this treatment for longer. After this time, you may need a ‘top-up’ treatment to help you maintain your eye lift. 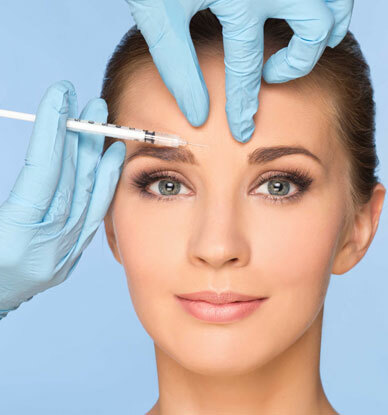 After a non-surgical eye lift or brow lift using dermal fillers and/or wrinkle reducing injections, the most common side effects tend to be bruising or swelling around the injection site or a mild headache (associated with wrinkle reducing injections). These issues usually self-correct within 24 hours. More serious side effects are rare if your eye lift is carried out by an experienced medical professional, which is why it’s essential to choose a practitioner with the credentials and experience to offer this treatment. Side effects can include eyelid drooping, changes to your eyebrow position, infection, or swelling. If you have any concerns or questions at all, please do call. Will I need to take time off after my treatment? This treatment is associated with minimal downtime. While most people carry on with their day as usual, you may experience some bruising or swelling and need some downtime while this resolves. It’s not uncommon to have two black eyes after this treatment, simply because the eye area is so delicate. Do I need to avoid any activities after the treatment or follow a specific aftercare regime? Dawn Attewell appears on the Save Face register for safe non-surgical treatments, which recognises only appropriately trained doctors, dentists and nurses. Your happiness and satisfaction matter to us. After your treatment, we will give you a 24-hour contact telephone number so that you can get in touch with a practitioner at any time. Want to know more about Eye Lift & Brow Lift?